Steve Jobs – How Do You Do Marketing in Today’s Digital World? Being an Apple fan for the last couple of years does not necessarily mean I knew much about Steve Jobs as a person. Only when I heard about his death I wanted to learn more about him and I bought Steve Jobs biography (affiliate link) written by Walter Isaacson. His visions, his passion and dedication for his products really impressed me. I thought if I could only have a little percentage of his values I could do great…Reading the biography was definitely a true inspiration for me and I hope you get a chance to read the book too. Guy Kawasaki had the privilege to work twice for Steve Jobs and in this video he tells you his 12 lessons he learned from Steve Jobs. Tony Dowling posted recently an article where he points out to 7 Great Powerpoint Presentation tips by Guy Kawasaki. 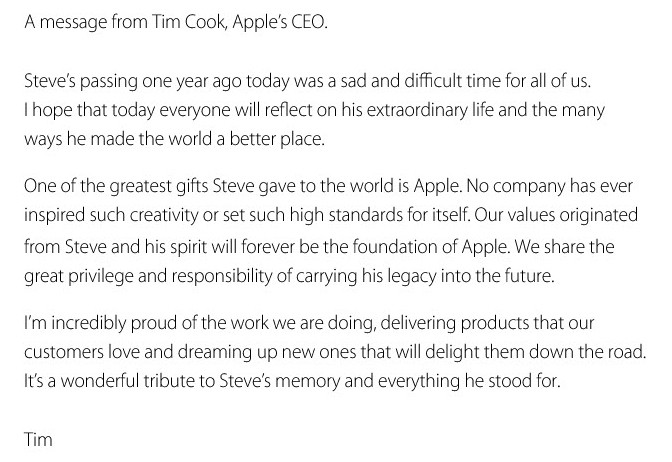 The message below has been posted on Apple’s website today. He changed the world and I was always fascinated by his passion and energy for innovation that improved our lives. My thoughts go to his loved ones. The world is missing YOU! Are you ready to take risks? Listen to Steve Jobs and you will feel better about taking risks. I am always fascinated to listen to the co-founder of Apple and Pixar, Steve Jobs.